Antique impressionist oil painting of a California sunset by Axel Linus (1885 - 1980). Oil on canvas, circa 1940. Signed. Displayed in a period giltwood frame. 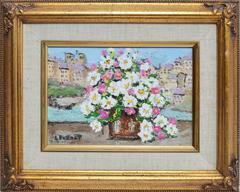 Image, 16"L x 12"H, overall 21"L x 17"H.
Antique impressionist view of a flower garden. Oil on canvas, circa 1900. Unsigned. Displayed in a period giltwood frame. Image, 10"L x 8"H, overall 16"L x 14"H.